Anliker, who is 90 percent blind, was honored by Root Sports as part of ceremony prior to game. Are you a fan of the Seattle Mariners? If you're a baseball fan in Oregon, there's a pretty good chance you are, due primarily to Portland's lack of a team and the Mariners being the closest Major League Baseball franchise in proximity. But if you are, you're likely not as big of a fan as Hillsboro's Dwayne Anliker, and Root Sports made that official Friday, Sept. 28, before Seattle's game against the Texas Rangers at Safeco Field. 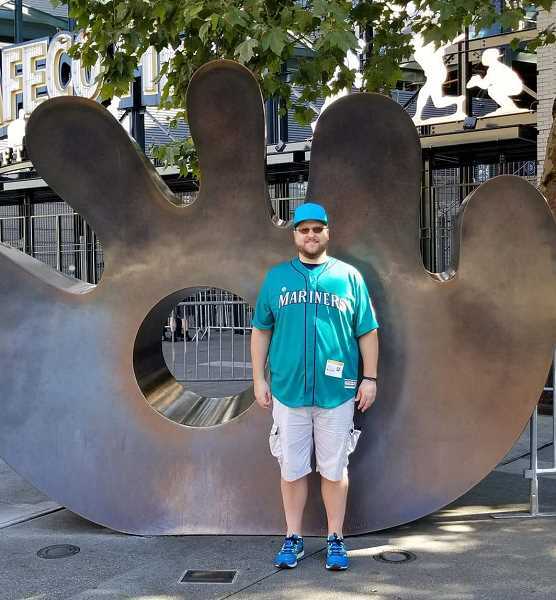 Anliker was one of five Mariners fans — and the only one in Oregon — to be selected as an Ultimate Fan by Root Sports, the cable network that televises over 150 Mariners games per year. As part of the honor of being selected as an Ultimate Fan, Anliker was flown to Seattle, put up in a hotel across the street from Safeco Field, and was a VIP guest of the franchise for their game against the Rangers on Sept. 28. Such an honor would be memorable for anyone, but for Anliker, it meant more — a lot more. "The world," said Anliker's mother Betty when asked what it meant to her son. "It was just really, really important." Anliker, 35, is legally blind. He lost about 90 percent of his vision as a result of a stroke he suffered four years ago. The then-31-year-old was misdiagnosed after suffering a series of headaches that would later be found to be the result of a brain bleed, which put pressure on his optic nerve and led to a stroke that ultimately caused his loss of vision. Since the stroke, Anliker is unable to work and lives with his parents, Betty and Dennis. "He almost died," said his mother. "The doctor said that most people who suffer similar trauma die." Dwayne Anliker has always been a baseball fan. He started playing the game in tee ball, continued playing through high school and later played various forms of recreational league softball, playing on as many as five teams at the time of his stroke. 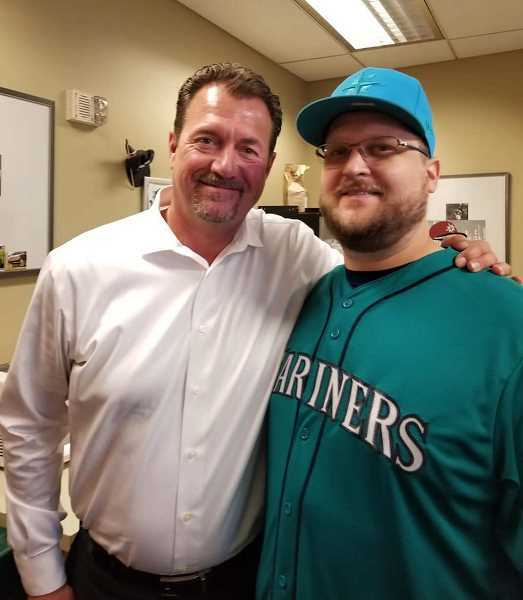 By his account, he started following the Mariners at the age of 12, drawn in by Seattle's famous playoff run to the American League Championship Series in 1995. "As long as I can remember I was always a fan, but it really became a huge thing for me in 1995 when they went to the ALCS," Anliker said. "I can still remember Edgar (Martinez) hitting the double and (Ken) Griffey Jr. scoring. We watched all those games back then, and that's when I remember it starting." 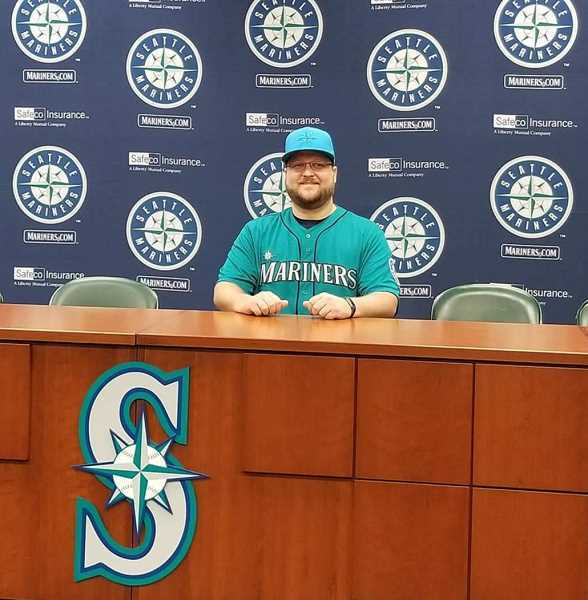 Two years later, Anliker was selected to go take batting practice at the Kingdome in Seattle prior to a game, where he fondly remembers his first real experience on a major league field. "I remember not hitting very well," he said with a chuckle. "I was extremely nervous. You have the hitting coach pitching to you and critiquing you. I also remember having photos taken and making pretend leaping catches and doing all the things a kid would do being on a major league field for the first time. It was a blast." Fast forward 21 years, and Anliker was able to experience it again — as an Ultimate Fan. Upon arrival, he and his father were ushered to their hotel room where a personalized Mariners jersey awaited Dwayne. On the back of the authentic home jersey, the name "Dewey" was stitched on the back, Dwayne's nickname since high school. "No idea," Dwayne Anliker said when asked how he got the nickname. "It was just a name I got in high school, and it's been that ever since." He and his dad took in the Mariners game that night, then the following day, they embarked on a full day of activities. Starting at 12:30 p.m., Anliker and his Ultimate Fan brethren took a tour of the stadium, filmed a commercial for Root Sports, were awarded trophies as part of a presentation prior to the game, and got to meet and spend time with Root Sports personalities like Jen Mueller, Mike Blowers and Anliker's favorite, Angie Mentink, who recently conquered a bout with breast cancer. "I appreciate her because she's a breast cancer survivor," Anliker said. "I think that's pretty cool." From there, Anliker and the four others were ushered to the Root Sports suite above home plate, where they enjoyed a catered meal and got to spend more time with Root Sports employees. Despite Anliker's disability, he could make out aspects of the field and stadium, and in a pinch, he viewed things through his phone as a way of making things easier. "I only look out of one eye at a time, but depending on what I'm looking at, smaller stuff is better for me," Anliker said. "When we were in the suite at the 100 level, I could see more of what was going on." In all, Anliker was thankful for the opportunity and thoroughly enjoyed his experience as an Ultimate Fan. "It was such an amazing honor and it meant a lot to me," he said. "Words really can't express it. It was a once in a lifetime thing, and like I was a member of the team for a day. Everyone was so incredibly nice and caring, I can't say enough about how they treated me." And what did it mean to his mother, Betty Anliker? "Everything," she said, tearfully. "It just meant a lot."